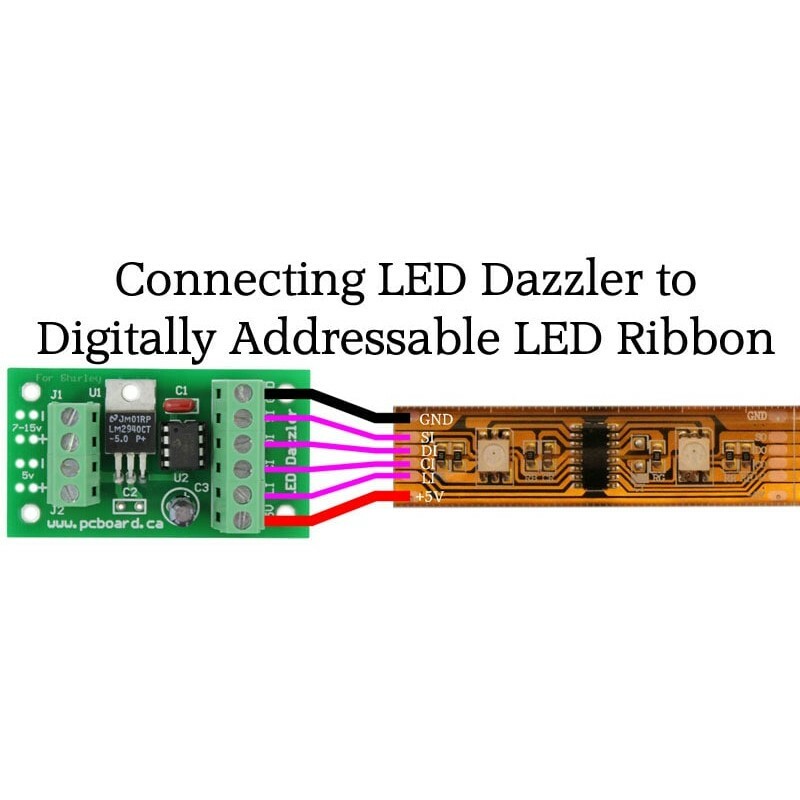 The LED Dazzler is a very complex, yet simple design to control HL1606 based LED ribbon. Using minimal components, the LED Dazzler controls LED ribbons, at 5 volts, of any size up to and beyond 5m (16+ feet) or more, producing a full color halo in stunning display patterns and sequences. 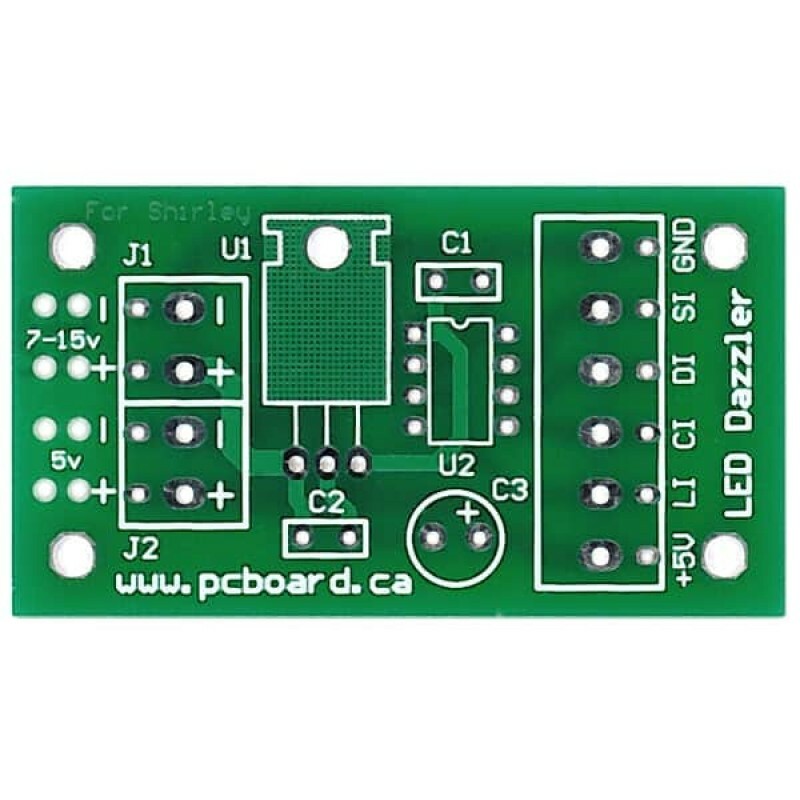 The LED Dazzler is available fully assembled, as a kit you can build, or just the bare board allowing you to supply your own components. Assembly of the kit in less than 15 minutes is possible. 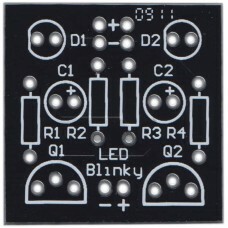 The board is a high quality, double-sided design, complete with solder masks on both sides, plated holes along with a high-contrast silk-screen labeling component positions measuring only 2.5" x 1.4" (64mm x 36mm). 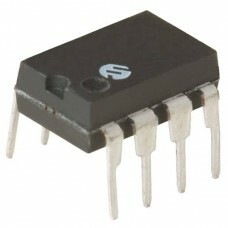 Power input and connection to the LED Ribbon is through high-quality rising clamp terminal blocks which simplify connections to the board or optionally soldering directly to the PCB. 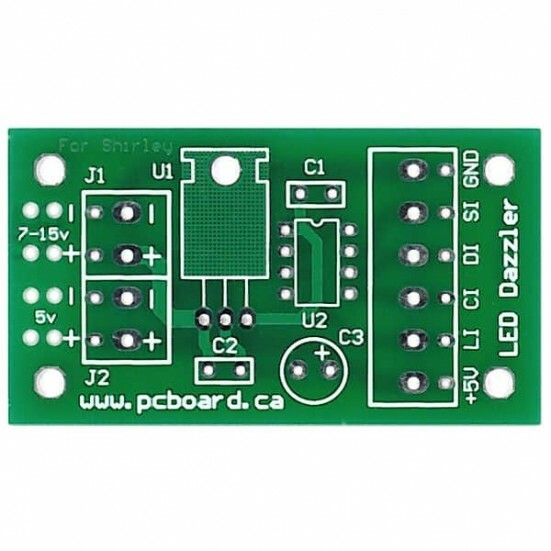 The processor used on the LED Dazzler is a PICAXE-08M processor, and comes shipped preprogrammed from us when you purchase a fully assembled system or a kit of parts. If you have a PICAXE Programmer, you can easily customize the displays and sequences of the included processor or use your own processors. For more information and technical details on the LED Dazzler, please visit our Support Site. 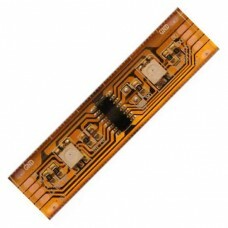 More information and ordering information for the HL1606 based LED Ribbon is available for the items web store listing. 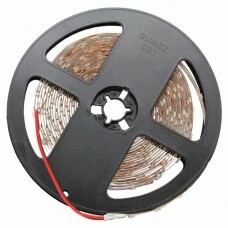 The LED Dazzler is offered as a stand-alone unit without a HL1606 compatible LED Ribbon or with various length options. If you will be running your LED Dazzler from a battery supper (or using the included regulator), we highly recommend using lengths of up to 1m in lengths. Longer lengths will draw more current through the regulator and increase its operating temperature. 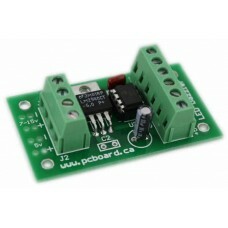 For lengths longer than 1m, our recommendation is to use the regulated 5v power supply input option to the board. We have also prepared a detailed user guide and construction manual available in PDF format. 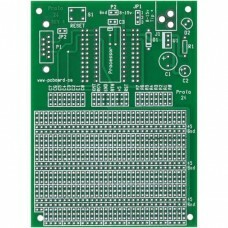 This item is only the bare PCB, no components are included. 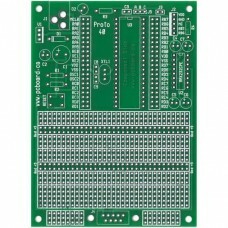 Proto-24 BASIC Stamp 2 Prototyping Board The Proto-24 is a general-purpose prototyping platfor.. 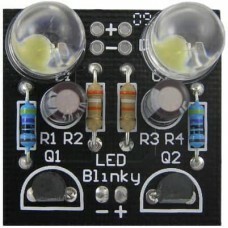 LED Blinky Kit The LED Blinky dual LED flasher is one of our simplest projects ever, can be assemb.. The latest in LED lighting is here, and it’s amazing. Each meter of the LED ribbon contains 32 ultra.. 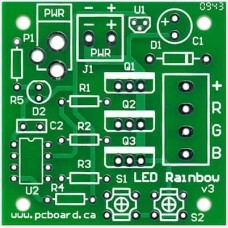 LED Rainbow Bare PCB The LED Rainbow is a dedicated Pulse Width Modulation (PWM) controller which .. 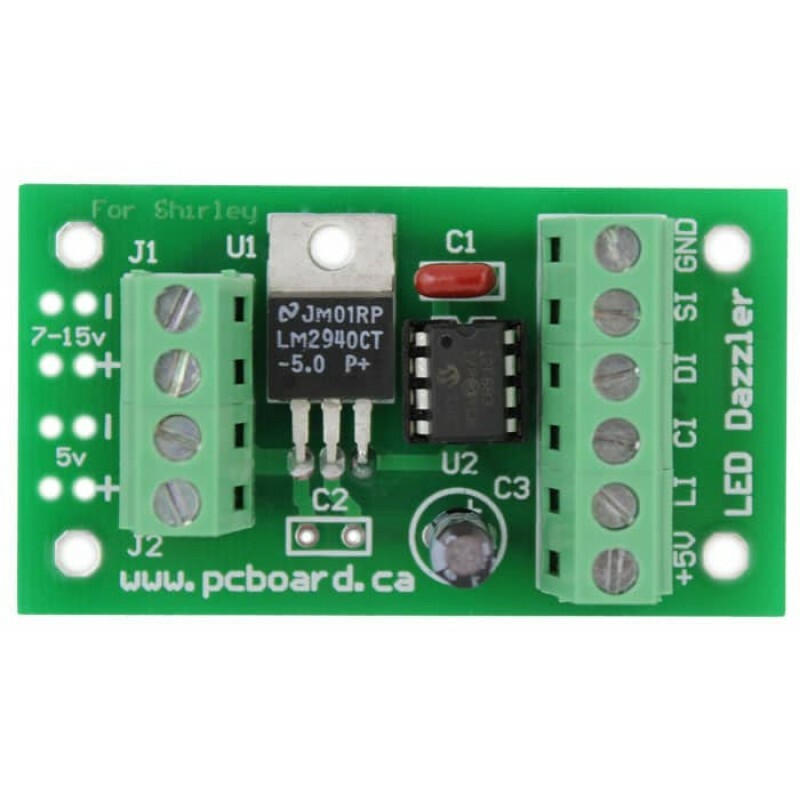 The LED Dazzler is a very complex, yet simple design to control HL1606 based LED ribbon. This is .. 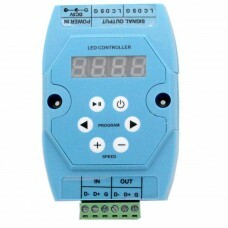 Controller allows for DMX or stand-alone control of HL1606 based LED Ribbons. Allows for full contro.. 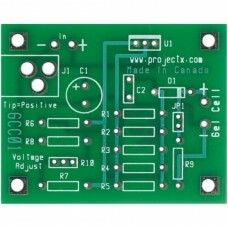 LED Blinky Bare LED Blinky Board The LED Blinky dual LED flasher is one of our simplest projects e..